FORTUNE -- Remember school lunches? Some of it was good -- the cookies, sometimes the pizza, mostly the items that would make any self-respecting nutritionist cringe. But in the past 15 years or so, schools have come under fire for serving a hot mess of carbs, salt, and too many trans fats. Serving palatable, healthy food is more difficult for schools than it should be. Budget cuts have forced most schools to skip cooking fresh food in their cafeterias and buy pre-prepared school lunches instead. That has meant that the food must be cheap and hold up during the ride from wherever it's prepared, which usually results in kids eating plenty of processed, high-sodium chow. But a growing movement of parents and students in schools want better lunch food, and one company may have figured out how to profit off of people's frustration with the old model. 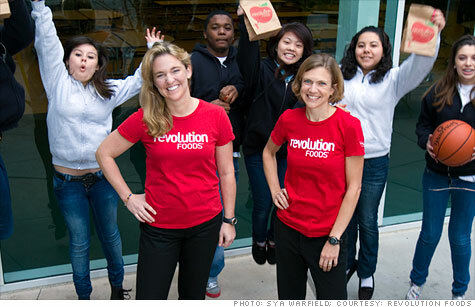 The company, called Revolution Foods, was founded in 2005 by former Citigroup (C, Fortune 500) investment banker Kristin Groos Richmond. It is based in Oakland, but the company has grown and teamed up with schools all over the country. Revolution Foods is one of many private food service companies partnering with schools, others include Aramark and Chartwells. The competition is big; another food service provider, a public company called Sodexo, has a market cap of almost $12 billion. Revolution Foods' selling point is that it is small and agile, Richmond says. It was built with sustainability and health in mind, so it doesn't have to retrofit its culture to meet evolving nutrition standards. The company can also quickly respond to the concerns of parents and students about issues such as menu choices, Richmond claims, and it tries to source its food locally and use organic ingredients whenever it can. There seems to be a hunger for its product. Revolution Foods -- which took the No. 2 spot on this year's Inner City 100, a ranking of the fastest growing inner city businesses in the U.S. -- is ending this fiscal year in June as a $50 million company. And the company has almost doubled in size every year since it was founded. Richmond predicts it will see a similar growth rate this coming year. It stays profitable via a couple of operations tricks, Richmond says. The company cuts costs by buying less-processed ingredients -- chicken on the bone, for example, or blocks of cheese that employees grate instead of the pre-grated kind. The meals come in at under $3 per-child, which is how cheap they have to be for partner schools to get them fully reimbursed by federal programs for low-income families. "You can still access convenience with fresh ingredients," Richmond says, "you just have to have really simple recipes and a simple toolkit." The company is riding the wave of a larger school lunch movement. In 2010, Congress passed the Healthy Hunger-Free Kids Act, which gave the United States Department of Agriculture the power to make changes in the National School Lunch Program. The new standards will go into effect this coming fall, and they should make a splash, says Margo Wootan, the Center for Science in the Public Interest's director of nutrition policy. These new requirements double the amount of fruits and vegetables school lunch programs must offer kids, Wootan explains. The new regulations also mandate that, over time, schools serve food that is rich in whole grains and low in sodium. As for Revolution Foods, Wootan says, the company has its heart in the right place but might emphasize the wrong aspect of nutrition. "They're appealing to the natural food crowd, that's their marketing shtick," Wootan says. She tried its lunches and remembers them as healthy and appealing, "But I think they focus on an area of nutrition that I think is less of a priority," serving natural food over nutrient-rich food. She says the difference in health benefits between eating processed peeled baby carrots and organic local carrots is negligible compared to the difference between eating carrots at all over potato chips, even the natural kind. But kids love potato chips, which is part of a problem all food service companies face. You can lead a child to healthy food, but you can't make her eat it. "Kids are naturally more finicky," says Lina Huang, the office manager at Yu Ming Charter School in Oakland, Calif., which partners with Revolution Foods. "And then, of course," Huang adds, "they like things like hot dogs," which Revolution Foods serves, albeit in their most "natural" form. Clearly, anyone who is passionate about childhood nutrition would prefer that children choose spinach instead of wieners. But that will take more than a menu change; it will require a reinvention of childhood nutrition education, something that both the government and Revolution Foods support. Ultimately, Richmond sees her company helping revamp national nutrition without sacrificing a solid business model. "I see Revolution Foods playing a very important thought leadership role for years to come in this field, setting a really high standard to point to. We're seeing the results and we're seeing the demand," she says. Of course, the ultimate goal is living in a world where kids buying school lunches choose a plate heaping, mostly, with fresh fruits, whole grains, and vegetables. That is a ways off, and will require a simplification of a process that has gotten far too complex; namely, putting a square meal on the cafeteria table. Still, Richmond says, "I do think a focus on fresh, real food is possible within a reasonable price point," a sentiment that does seem reasonable. She adds, "What I'm most proud of is taking away the excuses."